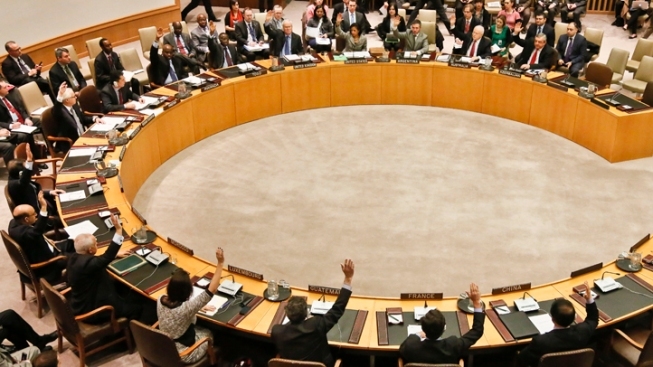 Members of the United Nations Security Council vote for tough new sanctions to punish North Korea for its latest nuclear test, during a meeting at U.N. headquarters Thursday, March 7, 2013. The unanimous vote by the U.N.'s most powerful body sparked a furious Pyongyang to threaten a nuclear strike against the United States. The U.N. Security Council responded swiftly to North Korea's latest nuclear test by punishing the reclusive regime Thursday with tough, new sanctions targeting its economy and leadership, despite Pyongyang's threat of a pre-emptive nuclear strike on the United States. Tensions with North Korea have escalated since Pyongyang launched a rocket in December and conducted last month's nuclear test — the first since Kim took charge. Many countries, especially in the region, had hoped he would steer the country toward engagement and resolution of the dispute over its nuclear and missile programs. Instead, the North has escalated its threats. The statement was carried by the North's official Korean Central News Agency, which issued no comment after the vote.